This demo allows you to take a photo with your phone, email it to FME Server and have an email sent back with a link to view the photo on a map. This demo utilizes FME Server's abilities to receive email, process it with a workspace and send an email. In this example we process an image attachment, but any attachment can be processed by FME Server. Simply take a photo with a GPS enabled smartphone, and send it to photo@demos-safe-software.fmecloud.com. You will receive an email back with a Google static map and a link to a map which shows the location of your photo. 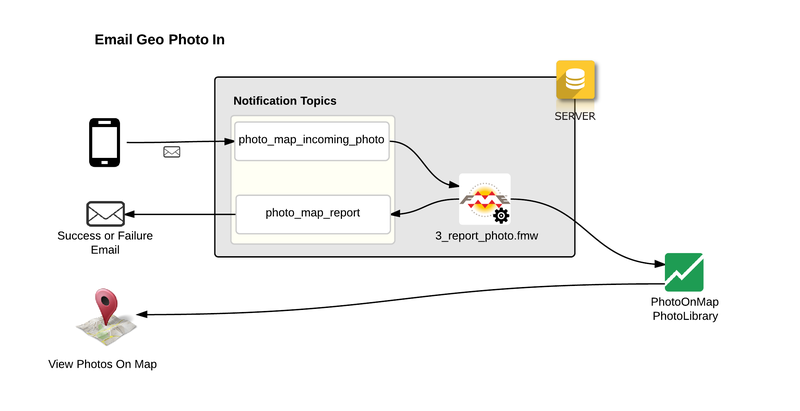 User emails a photo from their smartphone to the FME Server notification server. FME Server consumes the contents of the email and converts it to JSON which it passes to the photo_map_incoming_photo topic. The 3_report_photo.fmw workspace is subscribed to that topic and it runs reading in the contents of the email. The workspace extracts meta data from the photo including the location, rotates it if required, and then loads the data into a Google Fusion Table. Using the notification server, the workspace triggers an email back to the user who emailed the photo showing the location of the photo on a static map and a link to the map showing all photos. To run this demo you need FME Server and FME Desktop. This demo runs on FME Cloud which is one of the ways we can host FME Server. It is perfectly suited to processing email as FME Cloud instances are publicly accessible on the web. IMPORTANT: Check your firewall settings, Port 25 has to be open for receiving emails. photo_map_incoming_photo Will be assigned to the email publisher and receive content when people email photo@demos-safe-software.fmecloud.com. photo_map_report Used to report to the user if their photo submission was successful or not. Publish the workspace to the Photo-On-Map repository. When publishing register the workspace with the Job Submitter service and the Notification Service. Make sure to set the edit properties on the Notification Service and set the Subscribe to Topics to photo_map_incoming_photo. What this does is subscribe the workspace to the photo_map_incoming_photo topic so that emails that come in trigger this workspace with the contents of the email. Once you have run the workflow once the PhotoOnMapPhotoLibrary Google Fusion table will be created. The settings on the table need changing to ensure the data is presented in the optimal way.